DEARBORN, Michigan, July 15, 2011 (ENS) – Recycled tires, carpet and blue jeans are helping to reduce the environmental footprint of new Ford vehicles, the automaker said today. Ford and supplier Recycled Polymeric Materials (RPM) have found a way to give discarded tires new life as environmentally-friendly seals and gaskets for Ford vehicles. In total, more than 2.2 million pounds (997,903 kilos) of rubber from recycled tires has been made into RPM seals and gaskets and more than 210,000 used tires have been recycled. In addition, 150,000 pounds (68,038 kilos) of soy has been used to create the seal and gasket materials. The sustainable gaskets were first introduced to Ford in 2008 and are now used in 11 vehicle models. 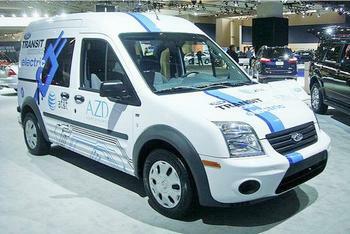 Ford Motor Company vehicles that feature the sustainable seals and gaskets include: Ford Escape, Ford Fiesta, Ford Focus, Ford Mustang, Ford Taurus, the Ford Transit Connect electric van, and the Lincoln MKS, as well as Ford’s F-150, F-250 and F-350 pickup trucks and the Ford Flex crossover wagon/SUV. Ford’s “Reduce, reuse and recycle” commitment is part of the company’s broader global sustainability strategy to reduce its environmental footprint while accelerating the development of advanced, fuel-efficient vehicle technologies. Over the past several years Ford has focused on increasing the use of recycled plastics and bio-based materials, provided these materials are environmentally favorable and meet the company’s durability and performance requirements. Examples include soy foam seat cushions, wheat straw-filled plastic, recycled resins for underbody systems, recycled yarns on seat covers, post-consumer cotton from blue jeans made into interior padding and natural-fiber plastic for interior components. On some models, Ford is using cylinder head covers made of a nylon resin from Wellman Engineering Resins made from 100 percent recycled carpet. During 2010, Ford’s use of Wellman’s nylon resin EcoLon® saved more than 4.1 million pounds (1.86 million kilos) of carpet from landfills and reduced oil consumption by more than 10,238 barrels of oil. The cylinder head covers are manufactured by Dana Holding Corporation. The cylinder head covers are used on the 3.0-liter Duratec engine in Ford Fusion and Escape. They can also be found on the 5.0-liter engine, which powers Ford’s Mustang and F-150 models. Ford says about 85 percent of the materials used on Ford vehicles by weight are recyclable, and 95 percent of all vehicles retired from use each year are processed for recycling.